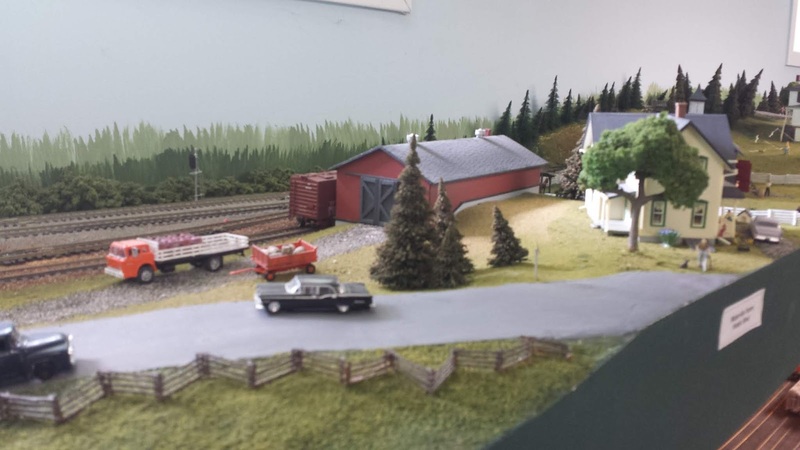 An HO-scale operating model railway located in Saint John, New Brunswick. The setting for the railway is rural Carleton County, NB ca. 1965. 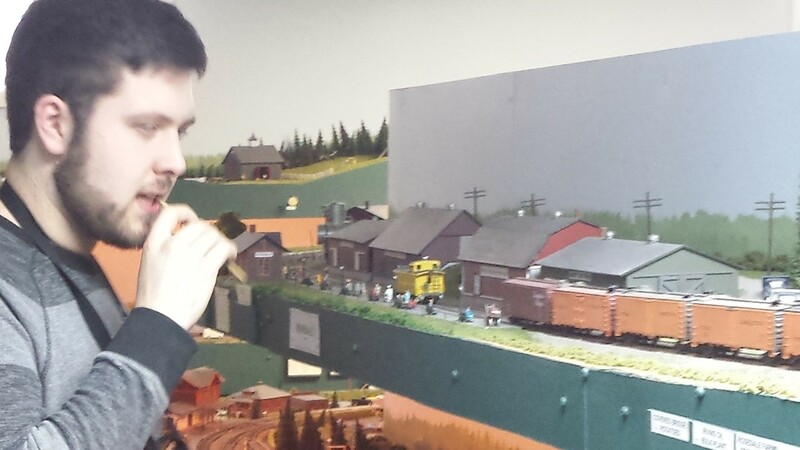 Once again, a great group of workers arrived last night to finish up the wiring for the expanded Carleton Railway. Seven SJSMR club members did a lot of soldering while I installed the new circuit breakers and the new NCE power booster. By the end of the evening, all tracks in the new area were live and the first train travelled from Silverdale to Waterville. Thanks guys! Sincere thanks to the eight SJSMR members who showed up in my basement to solder the wiring for the layout expansion. I am getting anxious to see trains running again, and having the help of so many friends was a major encouragement! Having eight people do more than two hours work equals about a month that it would have taken me. And it was a lot of fun too. 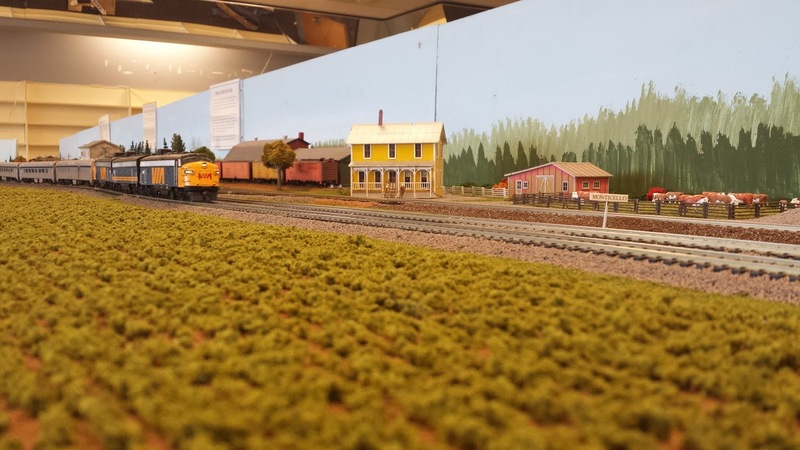 The Carleton Railway continues to make progress toward a grand opening of the expanded layout. 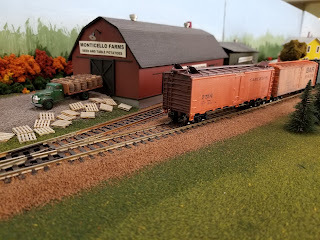 The new farming community of Rosedale is nearly complete--the main lines still need to be ballasted and lots of details need to be added, but the structures (mostly scratch-built potato warehouses) and much of the scenery are mostly complete. 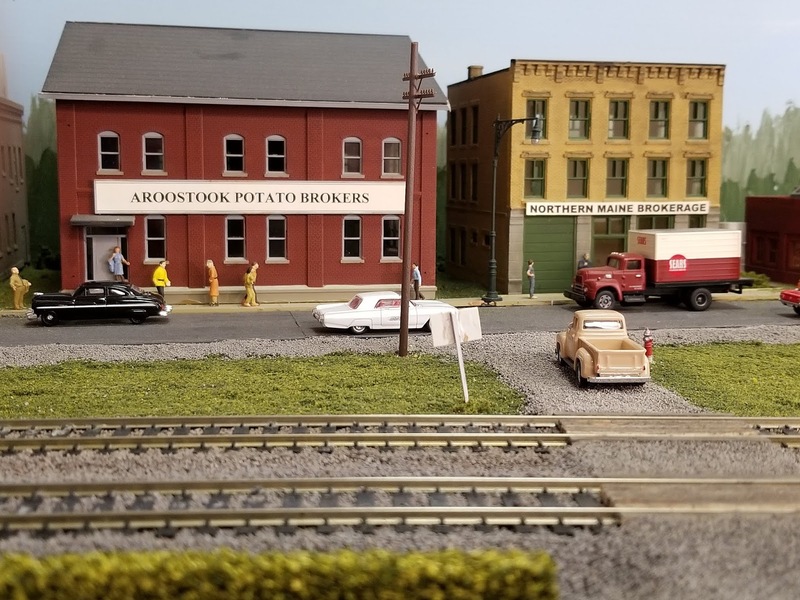 In the photo below, the Carleton York Peddler takes the siding as it passes The Mail Express at the new Rosedale passenger station (double-click photos to enlarge them). In the rural area between Rosedale and Silverdale, Carleton County, the Peddler approaches a private crossing that leads to a farm. The potato warehouse on the same farm still needs a roof! Those brown fields look bare right now but rows of potatoes will be planted in the spring. The biggest project ahead is the wiring of the new addition. With help from members of the local club (SJSMR) that should be completed in early January. The photos below provide some larger views of the new space. I have finally completed a new potato house for Rosedale Potato Shippers. This is the largest potato warehouse I have built; previously ones have been "selectively compressed" but this one is a more typical size for a prototype Carleton County potato house. 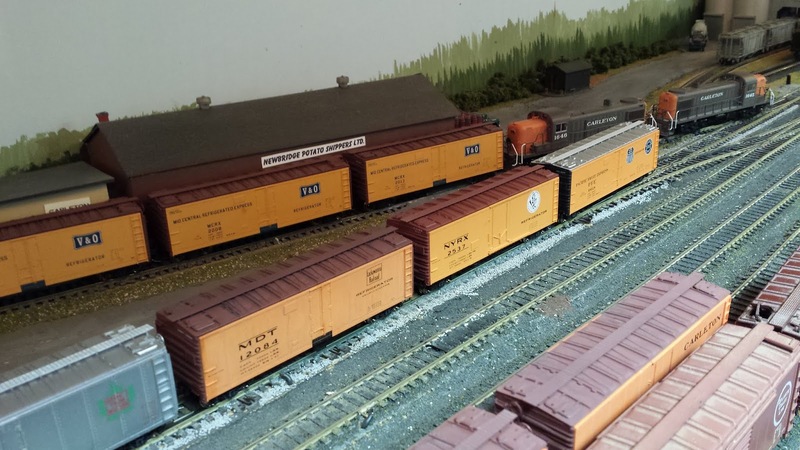 The doors allow three reefers to be loaded at once. 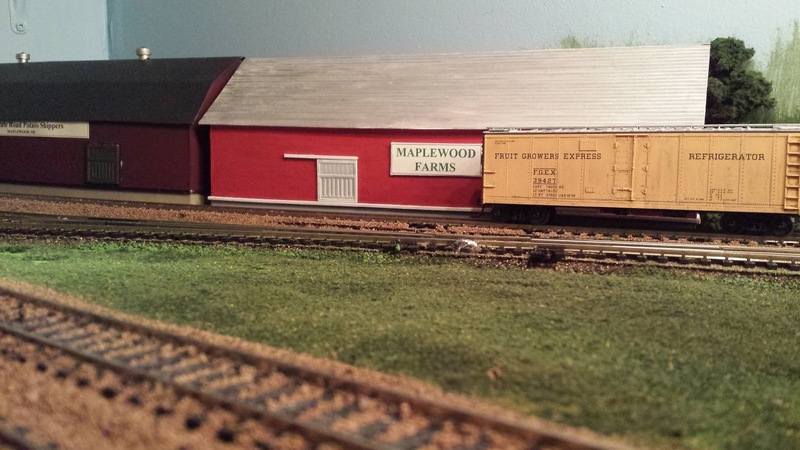 The building is entirely scratch built, using Evergreen styrene sheets, basswood strips, and Campbell profile shingles. The light over the door is from Woodland Scenics, the roof vents are from Alpine Division Scale Models, and the chimney is from Tichy. I still need to weather the shingles. This building will be located in the new addition in the basement. These scenes provide a sense of the importance of the potato industry for the Carleton Railway's western New Brunswick operations. In Rosedale, Carleton County, guest operator Taylor Main is switching the Valley Local (west-bound way freight) at Rosedale. Notice the string of five potato warehouses along the right-of-way, typical of several small line-side communities in the St. John River Valley in the 1960s. The nearby Waterville Farms potato house saves on winter heating costs by having earth banked against the foundation on the north and west sides of the building. Across the St. John River in South Newbridge, a pair of RS3s is spotting leased reefers at Newbridge Potato Shippers and at Carleton Farms potato houses. 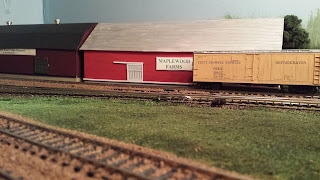 The two potato warehouses pictured below are located just over the York County line in Maplewood. 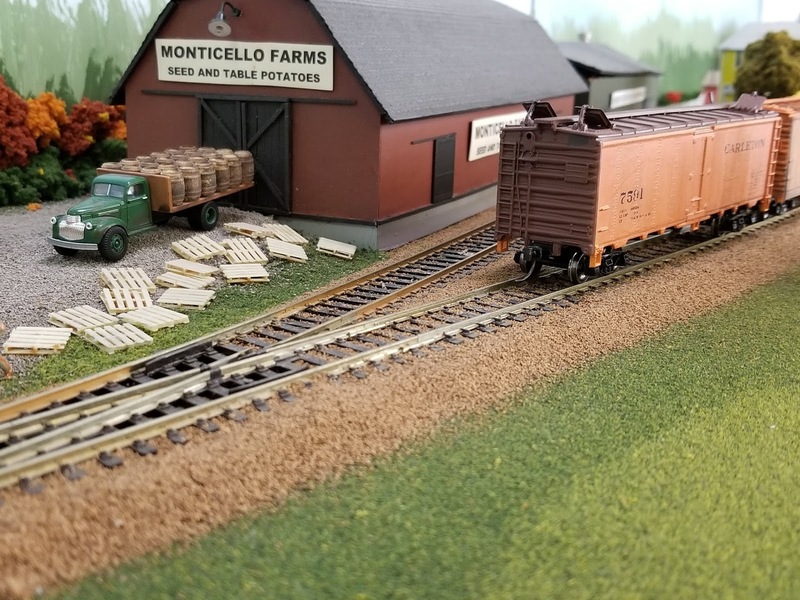 The Carleton Railway continues back over the county line to Cloverdale in Carleton County, where there are a number of potato farms as well as a remote yard where leased potato reefers are stored until needed. Hatfield Industries Ltd. in Grafton not only receives lots of potatoes for making "Cracklin' Crisp" potato chips, but it also has a starch plant as well. Produce terminals like Willett Fruit in South Newbridge are an important link between farm and store. Here is a closer view of some of the potato houses in Silverdale (formerly Rosedale) where three distinct building styles are apparent. McCain Foods has a frozen food shipping facility in Avondale--in the photo below, lots of French Fries are being loaded into those mechanical refrigerator cars. The VIA Atlantic cuts across Maine in this rural scene. Those rows of potatoes will provide lots of revenue for the railway when harvest season arrives. 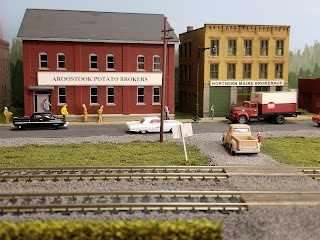 This series of photos show the importance of potato shipping for the prosperity of the Carleton Railway. 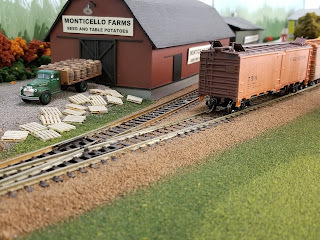 In Monticello, Maine, the Carleton Railway crosses the BAR tracks. 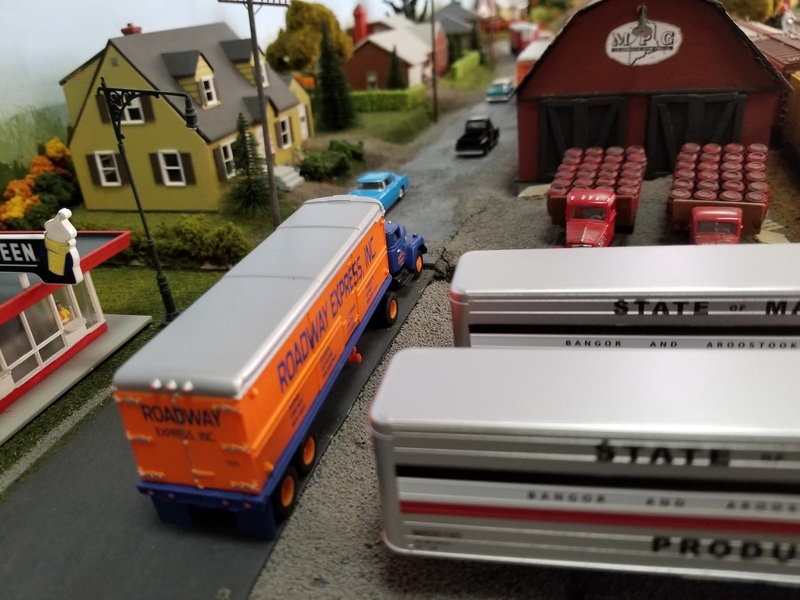 During shipping season, the small yard is busy with lots of ice-bunker reefers ready to be moved to nearby potato sheds for loading. The potato brokerage firms keep busy finding the best markets for this year's crop. The Monticello Farms hip-roof potato house shown below is typical of many in Western New Brunswick and Northern Maine. The smaller shed directly behind (Borderland Farms) is a more modern design. These two warehouses are located just outside of town, near the NB border. The Maine Potato Growers warehouse in the heart of downtown Monticello is another example of the hip-roof style. Those trucks are a reminder that the railway needs to provide efficient service in order to keep ahead of the competition! 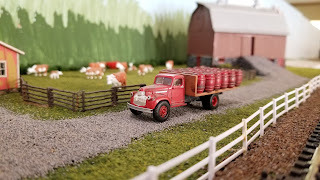 These old farm trucks seems to be everywhere at harvest season, carrying barrels of potatoes to the warehouse in preparation for shipping. 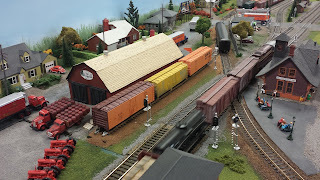 All of the above scenes are located on my six modules that are part of the SJSMR modular layout (currently on display at the Lancaster Mall on the second Saturday of each month). 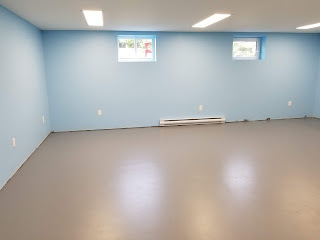 The new basement room (16' x 22') is now ready for the major expansion of the Carleton Railway. My goal is to have trains running on bare benchwork from Hawkins Corner to Avondale by Thanksgiving 2018 (a mainline run of 420' -- about 7 scale miles). 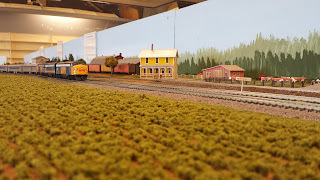 On the upper level, an entirely new "Rosedale" (on the wall to the left) will include not only a string of potato warehouses and more potato fields but also a long passing siding. The BQM meat packing plant in Waterville will be relocated to a new spot on the near wall to the immediate right of this photo. Below the Rosedale/Waterville level, between Nortondale and South Newbridge, a narrow shelf will allow trains to travel through a heavily wooded area. The small community of Clarkville (on the far wall) will feature another long passing siding. Once those two levels are complete the mainline will be operational from Millville (staging) to staging west of Avondale. At a later date (next year?) 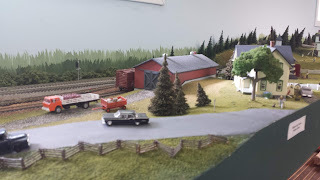 I plan to add a lower level--a large yard at Millville marking the eastern terminus of the Carleton Railway and the junction with the CPR Gibson subdivision. That will still leave a good-sized area in the middle of the room for a crew lounge and work area.